This great home at 25701 Leticia Drive, Valencia, CA, 91355 is located in the popular Sunrise tract in the Valencia 1 neighborhood of Santa Clarita CA. and has 3 bedrooms and 2 baths and 1128 square feet. This home is located off McBean Parkway. It is close to Santa Clarita & Valencia paseos and hiking trails. Wonderful neighborhood of garden homes with one common wall. Super starter home if you are interested in homes for sale Valencia CA! Great schools. See more below. Welcome! Pride of ownership best describes this beauty newer tile roof, copper plumbing, professionally landscaped front and rear yard with state of the art Irrigation system (water saving smart timer)…. Walk into this beautifully decorated open floor plan w/tile floors thru-out, newer carpet in all 3 bedrooms, recessed lighting, ceiling fans, plantation shudder, French doors, custom kitchen cabinets and stainless steel appliances…. Garage lovers you will love this nicely finished 2 car garage w/storage cabinets, floors, drywall, and a new tank less water heater that instantly provides hot water thru-out. All this on a cul-de-sac street, nearby walking paseos, community pool, and Valencia Mall. Call today! 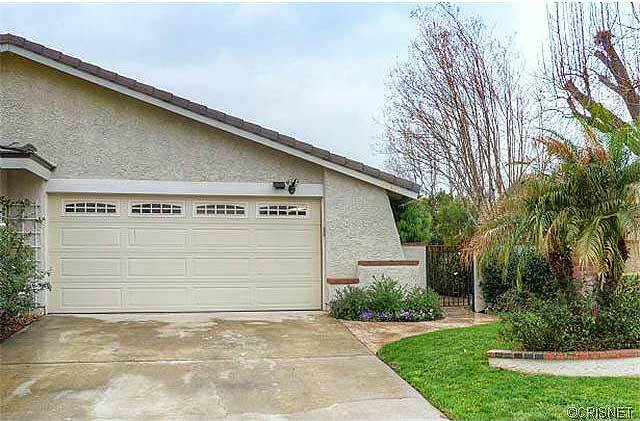 This Valencia CA home for sale at 25701 Leticia Drive, Valencia, CA, 91355 is located off McBean Parkway. with great access to the Golden State Freeway, YMCA, parklands, Valencia town center, and recreation areas. This is a standard sale.